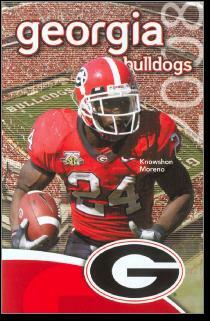 Knowshon Rockwell Moreno was born July 16, 1987 in the Bronx and grew up in Belford. His unusual name in a combination of his father, Knowledge Moreno, and his mother, Varashon. Fast and strong, Knowshon excelled at youth football and won a starting spot in the backfield for Middletown South High School his freshman year. He led the Eagles to state championships in 2003 and 2004, scoring 26 and 40 touchdowns. The 2004 team dominated opponents, outscoring then 476 to 67. During Knowshon’s senior year in 2005, he eclipsed the state record for touchdowns, finishing with a career mark of 128, while his 6,268 yards ranked second all-time. He was also a record-setting sprinter who won state titles in the long jump and triple jump. A half-dozen Top 25 football programs recruited Knowshon, including Michigan and Virginia Tech. He accepted a scholarship from Georgia and red-shirted the 2006 season. Knowshon became the Bulldogs’ starting halfback during his freshman year in 2007. He had 188 yards and three touchdowns in a victory over arch-rival Florida and later joined Herschel Walker as the only Georgia frosh to surpass the 1,000-yard mark. Knowshon finished the year with 1,334 yards and 14 touchdowns. He was honored as first-team All-SEC and was SEC Freshman of the Year. Knowshon’s sophomore season was as good as his freshman year, with 1,400 yards and 16 rushing TDs (18 total). Losses to Alabama and Florida spoiled an otherwise fantastic year for Knowshon, who was named Georgia’s offensive MVP and repeated as a first-team All-SEC selection. In what would be his final game, Knowshon caught a 21-yard scoring pass at the end of the Capital One Bowl to seal a 24–12 victory over Michigan State. He declared for the NFL Draft the following week. The Denver Broncos selected Knowshon with the 12th pick in the draft. They selected pass rusher and fellow New Jerseyan Robert Ayers later in the first round. Knowshon saw plenty of playing time in 2009 and led the club with 947 yards. He also caught 28 passes and scored a total of 9 touchdowns. He led the Broncos again in 2010 with 779 rushing yards, adding 37 receptions. A knee injury limited Knowshown to just 7 games in 2011, but he bounced back in 2012 to help the Broncos fashion a 13–3 record. He split time in the backfield with Willis McGahee behind Peyton Manning. In 2013, Knowshon cracked the 1,000-yard mark and reeled in 60 passes to help Denver win 13 games again. Knowshon was the first Bronco to gain 1,000 yards on the ground and 500 in the air during the same season. The team made it to the Super Bowl but lost to the Seahawks. Knowshon signed a free agent deal with the Miami Dolphins in 2014. He played three games before reinjuring his ACL, ending his NFL career. In six seasons, he ran for 3,616 yards and caught 158 passes for a total of 36 touchdowns.